Cherry laurel (Prunus caroliniana) is a member of the rose family. The plant is low-maintenance and becoming as popular in North America as it is in Europe. The plant is an example of why gardeners need to get all the facts about a plant before they purchase. The plant is beautiful, but parts of it are highly toxic to both humans and animals. It is the plant's self-defense system. Cherry laurel should be planted away from children’s play areas, where it can be enjoyed in safety. The tree is an evergreen that grows from 20 to 40 feet tall, with a trunk diameter of up to 10 inches and a crown spread of up to 25 feet. Yellow-green to dark-green, oval or oblong leaves measure 2 to 4 inches long and about 1 inch wide. 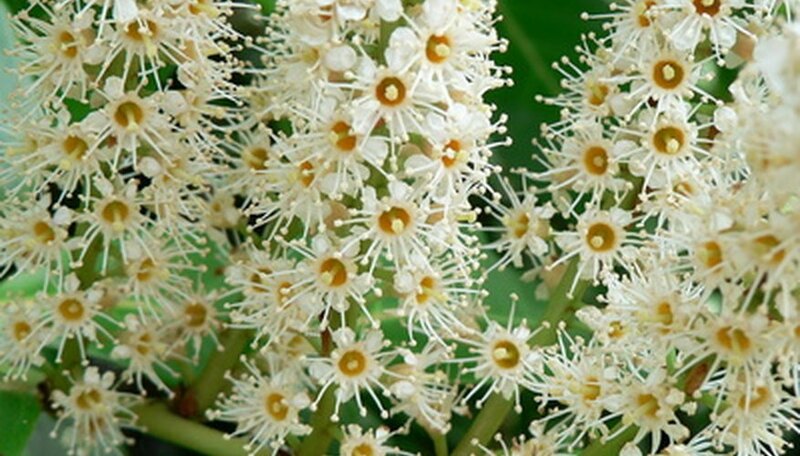 Fragrant, white flowers bloom in thick clusters in late winter and early spring and are followed by small, blue-black, edible fruits. The plant is found growing in moist environments from North Carolina south to Florida and then west into Louisiana and Texas. The plant is hardy in USDA zones 7 to 9. Cherry laurel adapts to different types of soil and needs that soil to be moist but not wet when young. Too much water can kill the plant. Once the plant is mature, it will withstand a period of drought. Plant in full sun if possible. If not, it can take partial shade. The plant grows as a shrub or small tree and is used as hedges, privacy screens and as part of a wildlife garden. It is also used to make topiary. The fruit is a food source for birds and small mammals, and many species of songbirds will come for a meal. The flowers are a nectar source for bees and other insects. The leaves and branches of the poisonous cherry laurel have large amounts of cyanide, a fast-acting poison. Cyanide kills the body's cells by blocking their access to oxygen, affecting mostly the brain and heart. Rapid breathing, restlessness, dizziness, weakness, headache, nausea and a rapid heart rate will appear within minutes. Exposure to large quantities will result in convulsions, low blood pressure, slow heart rate, unconsciousness, damage to the lungs and finally respiratory failure and death. Patients who do survive cyanide poisoning may still suffer from brain and heart damage. The plant releases many seeds, and they will all appear as new plants the next year and need to be removed. People allergic to bee stings need to be careful. The flowers will attract a multitude of the insects. Mited, borers and caterpillars damage the plant, and it is susceptible to leaf spot, fireblight, stem canker and root rot.